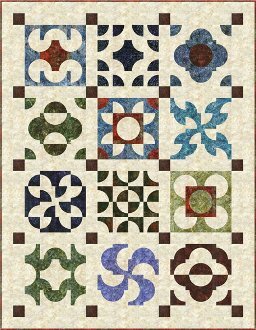 This quilt is designed as a Block of the Month and requires the 4" Drunkards Path Template. Each of the 12 blocks is written on a separate sheet of paper so you can do one block at a time. You could also repeat your favorite block and make your own design. The finishing directions are included for the quilt as shown. A great way to experiment with different arrangements for this favorite block. Make it scrappy, each block uses approximately 1/3 yard of two different colors and finishes at 14". Quilt measures 66" x 85". You could also choose to use the 3 1/2" Small Paths Template.